Getting a good sear on pork chops can be difficult when you're trying not to burn or overcook them, especially if they're pretty thick. This method will let you get a flavorful sear on your pork chops without sacrificing the tenderness of the meat. Photo by Mark, Vicki, Ellaura and Mason. Sear the chop on one side until you get that beautiful brown crust, flip it over and immediately put it on the lowest rack in a 450°F (232°C) oven. Continue cooking until an instant-read thermometer inserted horizontally into the center of the meat registers 130°F (54°C), about 5 to 10 minutes more depending on the thickness of the chop. ...by cooking on the lowest rack closest to the heating element, you will achieve a nice sear on the second side as well. 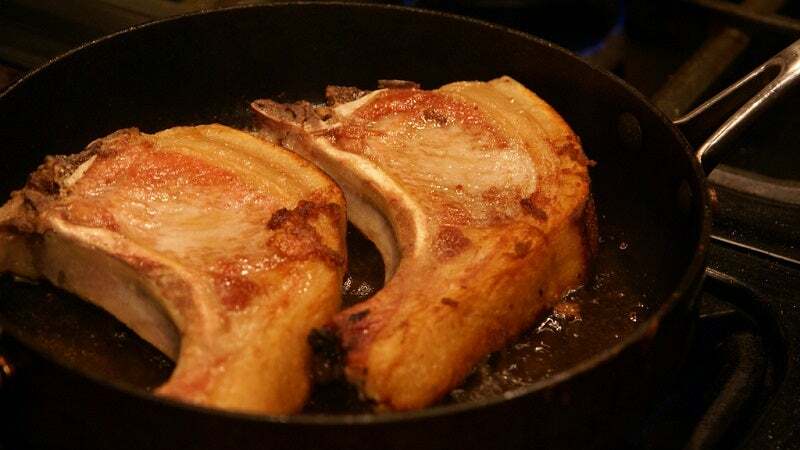 Martinez's process is for pork chops specifically, but the same method can be used for thicker steaks as well. Keep in mind when you cook, however, this method will create some smoke when you're searing the first side of the meat and when you open the oven to remove it, so make sure you have a way to ventilate your kitchen if need be. If you're worried about your pork chops curling, a few cuts is all they need to stay nice and flat. yummmmmmm...........I want a pork chop! Pork chops taste good. Bacon tastes good.